Seven of Cups says the greater you stretch yourself, the more fear there will be. Where fear exists, there is also the opportunity for growth. Don’t hold back now – move on. Use your fear to catapult you forward. Wonderful visions must be grounded in both action and the outer realities of life or they will remain only day dreams, without any real meaning or value. Rise above your circumstances. Be realistic now and narrow down your choices using your common sense. Visualize the possibilities and see clearly in your mind the good things for the future. With your skills and abilities so well developed – it is time to decide where and how to use them – allow your mind explore the potentials. You have begun to include others as extensions of the self. As the self approaches the ideal of universal love it must somehow accommodate the world as extension of the self. Here is a taking stock, a look at the material interface, a harvesting at the emotional level and then a reinvestment in the emotional future. As such you must open up to take a good look at your emotional storage bins. In the process, not only do you survey your progress to date, but in a sense you open up Pandora’s Box. It is a test for all relationships and for any creative affairs. Its function is not to destroy what we already have, rather to expand and enrich as we move out into and eventually through, our extended family in the lessons of the higher Cups. If our existing relationships are not up to facilitating this enrichment, we may be asked to leave them behind and should we not do so, they will wither and fall away of their own accord, for rest assured everyone’s emotional karma demands growth and inclusion, not exclusion. The result is a barrage of new opportunities and you are becoming fully aware of them. Here are the positive aspects of fantasy, of myth. How are you overdoing or indulging yourself? What are your fantasies for the future? List at least seven. What are your current daydreams? How are you deluding yourself? What mystical or religious visions are you experiencing? How are you gratifying your senses? Next to World: Look at your life and be prepared to make decisions – do not be afraid – attainment can be yours. Next to Lovers: Be considerate of others when making important changes in your life – your path is broad enough for two. Next to Wheel of Fortune: You can become very successful if you seek out the right advice before moving ahead. In the first position: Your life will be the stuff myths are made of. Everything that happens will carry emotional weight that others will find fascinating and want to measure for themselves. You cannot help but be visible and set an example of how life is meant to be experienced. In the second position: Your base may appear solid and indeed it may be as reliable as granite, but its pieces are highly energized and mobile. Its strength is in the number of pieces and the quickness with which you can cover your bases. Your physical strength is your physical involvement in numerous arenas. In the third position: Now is the correct time to try many new things. Save for the encouragement of this reading, you would most likely turn down some extraordinary opportunities. These are not things you have done much of before. In the fourth position: Two actresses will anchor our wide span of the positive side here. First, Katherine Hepburn whose range of emotional awareness and experience challenges the limits of human understanding and yet with a personal life centering on few partners, principally one – Spencer Tracy whom she never married. Second, Elizabeth Taylor, whose range is also challenging to mere mortals and with a personal life splashed with many true loves whom she married. In the fifth position: Is your bed covered with travel brochures? Making a list, checking it twice? To say that you have plans is an understatement. In the sixth position: In the near future your emotional/creative palate will be full with the rewards of the past as you reap an emotional harvest. How do you reinvest? Which energies do you use and which do you conserve? Here your heart must review the many possibilities for the future. In what do you plant your emotional seeds for the new season? 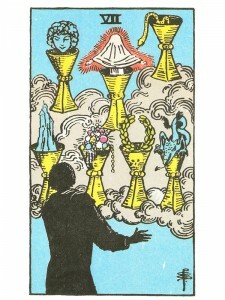 In the seventh position: This will be a time when the creative juices will flow with little or no encouragement. Your sensitivity will be at a peak, your mind abuzz with possibilities. Serious decisions will be made to successfully transform your Emotional/creative Plane into a broader, more productive use of your full potential. In the eighth position: Your physical body and/or your material world is undergoing a range of experiences perhaps more varied and powerful than anything yet to cross your path. Enjoy, it’s all delicious and just what the doctor ordered. In the ninth position: There is great satisfaction with your emotional and creative affairs as they have been fruitful for you. Your heart wishes to bring a wealth of new energy into that circle and to be even more fruitful, as it anticipates the next level of growth on your path. In the tenth position: Begin now to prepare for the third and highest level of your emotional path. Whereas in the first level, self was concerned with the individual and in the second level self grew into concern of others as extensions of itself – here in the third level – the self is growing into concern with the world as extension of self as it approaches universal love. What does the tenth position mean? Is this a good result/resolution or will everything remain a fantasy? THANKS YOU, I REALLY APPRECIATE YOUR HELP. I came here searching for the meaning of 7 cups in Self or first position. When I saw that in my reading, I just thought it meant I was delusional! : DWhen I read your answer it was profound, tickled some subconscious themes of mine, was a lovey relief but was also really unexpected. I laughed and laughed for a good deal of time, like 5 minutes straight. I needed a good laugh, in the most positive healing sense. Thank you for that, and for your wonderful perspective on things. Special Messages based on card position: In the first position: Your life will be the stuff myths are made of. Everything that happens will carry emotional weight that others will find fascinating and want to measure for themselves. You cannot help but be visible and set an example of how life is meant to be experienced.